Dale Clearwater and a young prospect "mirror" a cow. Alright, it’s short and sweet. But I think the information inside is very helpful! In this short video clip, professional working cow horse trainer Dale Clearwater of Hanley, SK, defines and shows us how to properly “mirror” a cow. Plus, he outlines some of the benefits of implementing this proper technique later on in a fence run. If you like it, let me know and then perhaps I can dig up some more of Dale’s insightful advice. Liked the Dale Clearwater video. Do more on working cow and cutting. 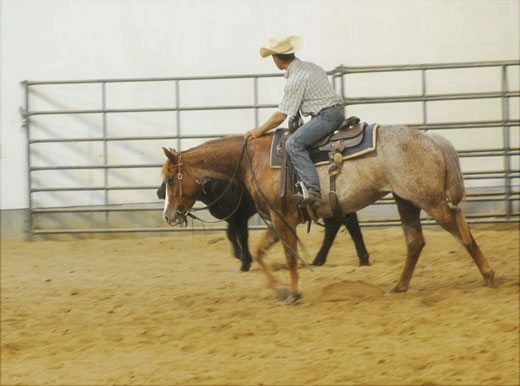 I agree, I would love to see more articles/videos about training the cow horse. Love the idea of short ‘n sweet instructional videos! Great tips, very clear, keep ’em coming! I agree as well – keep up with the cow work!